Let’s start by modifying the title. Early Career Reflections: Perseverance. This affects everyone, and it’s nonsense to pretend it’s just a pre- or post-doc issue, or an early tenure question of faith. Perseverance is something that one usually comes across LATEST during the PhD, but should realise, if choosing academia, it is probably going to remain with you for a long time. The need for it, that is. For me today, it’s definitely been one of those days, if not weeks or months that I feel the need to persevere. It’s not a feeling one gets easily used to, but one that you must learn to accept as being part of the work stress related to a career in the academe. I have learnt as much indirectly from excellent senior colleagues along the way, yet it brings you down. Every time. No one wants a job where you must persevere. 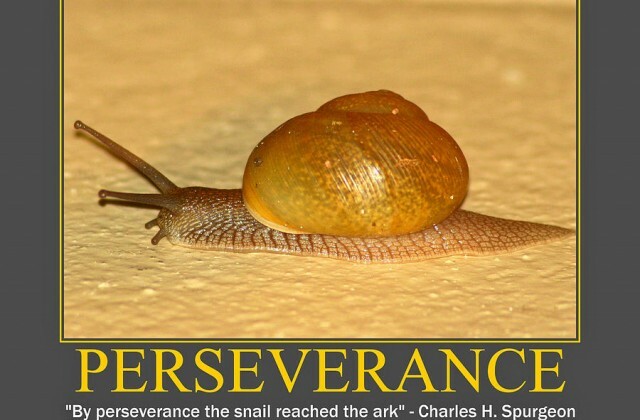 But if we look at this objectively: a lot of great things in life occur as a result of a massive dose of perseverance. I bet fine art doesn’t just emerge without pain. How about some great companies like Apple today – someone must have persevered a little for that. Not to even mention Nobel prize worthy research – or for that matter most of any research that ever gets published, as well as heaps and heaps of other wonderful work that just.. didn’t quite make it in the end. The difference between the latter two is probably the P word again. Perseverance isn’t dispassionate immunity to setbacks, and it isn’t despondency or resignation. It’s acceptance of how you feel, because that’s how you feel. It’s acceptance that everyone else has probably felt this way at some point before. And it’s acceptance that next time can always be different. via The Early Career Blog: Reflections: Cumberland Lodge & the theme of perseverance.